Being sick is the best! Said no one ever. Other than perhaps a man with a man cold who likes getting a little extra attention. But man colds aside, being sick is the pits. Especially when you have a house full of young children and the flu and cold bugs just keep getting passed round and round and round.. “I’ve heard winter activities are quite pleasant, but we haven’t been able to get out much due to all of this sickness…” “What? There is life outside of barf and fevers and staying up with multiple sick children while I carry around a barf bucket of my own?” Don’t lie. We’ve all been there. Let us curse together in remembrance. Enter homemade elderberry syrup. Not only do elderberries contain immune-enhancing properties, they also have powerful antiviral properties that are helpful in treating viral infections. When cooked, elderberries are completely safe for old and young alike. In some people, when large amounts of fresh elderberries are consumed they can cause diarrhea and upset stomach. Prior to this year, when one child would come down with a bug, I would run to the store and shell out my money for precious elderberry syrup. I would give it to everyone else (myself included), and the vast majority of the time no one else would get sick. Seriously. I initially thought it was a fluke. Can it really work this well? But it’s proven itself over and over and over. 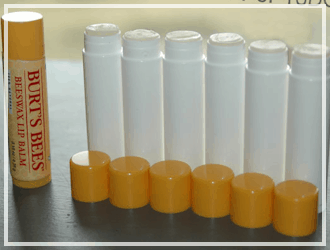 It even aided our fight in keeping dreaded Hand Foot Mouth Disease to one child. I have always wanted to be able to give it to each family member as a daily supplement during the winter, but because of the cost I have not been able to do so. And then I found out how easy and cheap it is to make your own. Enter happy dance. It really is so simple. There are a million versions out there, and it’s really hard to mess up. The best part? My kids love it. LOVE it. When they see me pulling the jar out of the fridge in the mornings they all come running. And no need to save it for medicinal purposes. It serves as a pretty tasty pancake syrup too. Bring water to a boil in a medium saucepan or dutch oven. Remove from heat, add elderberries and cover. I like to let the elderberries steep for 1-2 hours. Does it make a huge difference? I don’t know. Probably not, but I do it anyway. Add ginger, cinnamon, and clove powder if using. They are not necessary ingredients, but we like the taste they lend, and they have awesome medicinal properties of their own! Bring mixture back to a boil, cover again, reduce heat to a simmer and let simmer for about 45 minutes, until liquid is reduced by around half. Remove from heat and let cool until lukewarm. Pour through a fine mesh strainer and discard elderberries and cinnamon sticks. Stir in honey or glycerin (or a combination of both to equal ¾ C). 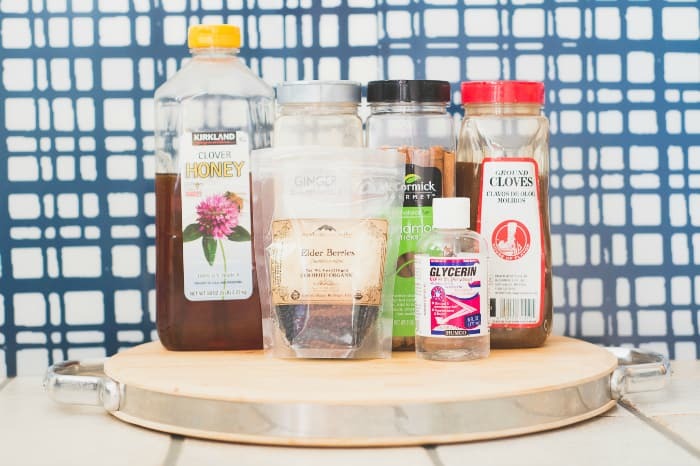 Honey is not my favorite taste, so if I have glycerin on hand, I will use some of it in place of the honey. My kids and husband don’t mind the full honey taste at all. Pour into a pint sized mason jar and refrigerate. It should keep for several months in the fridge. For a daily immune boosting supplement give ½-1 tsp for kids over 1, and ½-1 Tbsp for adults. When you feel a bug coming on, take the regular dose every 2-3 hours until symptoms subside. Now let’s cost compare to the store bought version. At my local grocery store, a 4 fl oz bottle costs $16.99 or $4.25 per ounce. Pricey stuff, but I’m a sucker. This stuff is worth its weight in gold. And diamonds. And whatever is selling for the highest price on the black market. Total Price for 16 oz of homemade elderberry syrup: $4.45, or about $.278 per ounce. That means our homemade version, without shipping is 98% cheaper. Seriously!!!!! This is one of my most cost efficient recipes ever. Even with paying for full priced shipping it’s still a heckuva save. How about you? Are you already a fan of Elderberry? 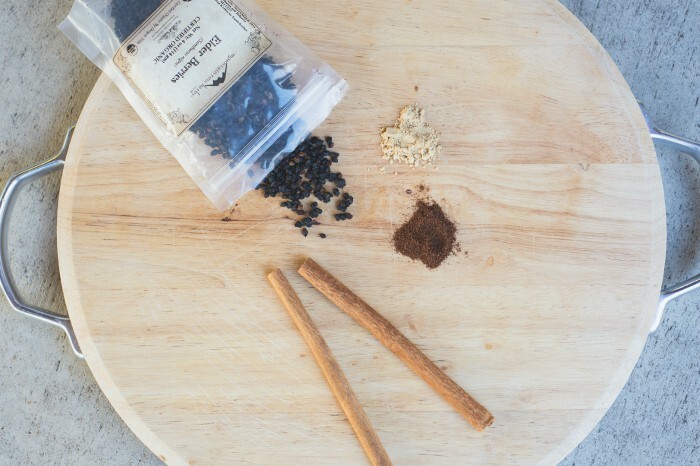 What are your favorite herbal immune boosting recipes? 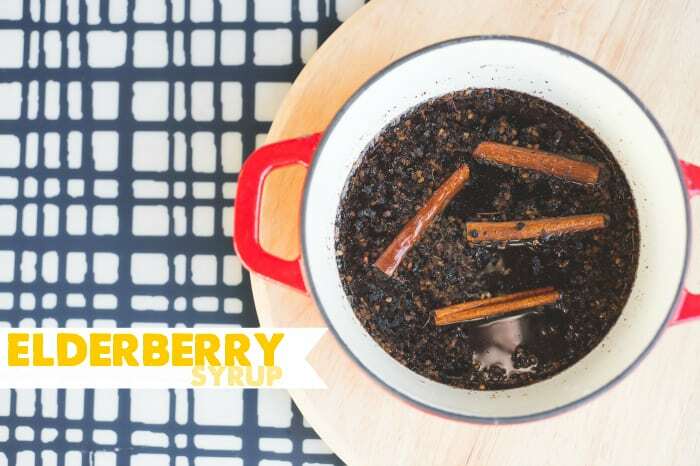 DIY your own Elderberry syrup to boost your immune system. Give the finger to flu and cold season. 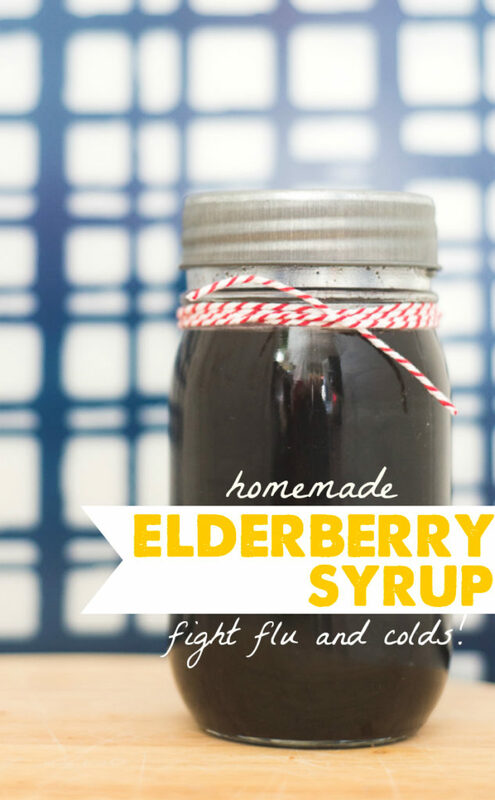 My kids love the taste, and Elderberry Syrup can drastically boost the immune system. Waaaay cheaper than the store bought version! I think it’s an excellent idea, I enjoy when I do it with my own hands. Hi! I believe my 16 yr old may have HFMD…I would like to make the elderberry syrup and was wondering if you’ve ever used the Cinnamon and ginger essential oils in it. I gather elder berries to make jam. How many cups fresh/frozen elderberries do you think would be comparable to 1/2 cup dried elderberries? I believe it’s about double, so 1/2 cup dried would equal 1 cup fresh/frozen. We have an elderberry tree and I freeze them. Do you think that I would use them the same was as dried in this recipe? Is this recipe too much to use as normal syrup on pancakes or is it specifically tailored to medicine purposes? This is more for preventative health, thanks! Hmm, yes, this looks really good! More tasty than what I’ve been used to. I’ve used elderberry tincture for a long time with excellent results. We just take about a half lb. of dried elderberries, mix with a quart or so of 100 proof vodka and let it sit for a month. The alcohol draws out the immune boosting properties of the berries!. Strain out the berries and keep the liquid in the fridge for, oh, say, 6 months. . . To administer: mix 1 tsp with 8 oz water or juice and take on an empty stomach for best results. Do this 2-3 times daily for no more than 8 weeks– your body’s response will lessen over time, and you need to “trick” it by using a different supplement for a while. Then you can go back to the tincture. Got this from my aunt who is a nurse and desperately needed something to get her through flu season in the ER. 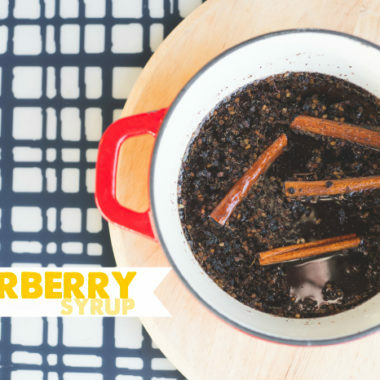 We have used the store bought elderberry syrup for years! This is our first year a using homemade syrup, so far it has been working just as well as the store version. We have elderberry trees in our area so last summer we picked, juiced and froze the juice. Every recipe I have found calls for using dried berries so I had to guess how much juice the recipe used after boiling the berries in water. How much did you end up with after you boiled it? Any other suggestions for using fresh elderberries? I have heard jellies and teas are really good too! We in my country my country male elderberry jam or syrup the following way. When we have the fresh fruit, just picked we take a glass jar and put a layer of sugar and a layer or the berry. In end we go in with sugar again. But make sure to put more sugar on the bottom and the top. Let it sit for a month in dark or at least in a room without direct sunlight and it is ready to use. Or mix the sugar with the elderberry and let it sit in warm and sunny. You can use Honey too instead of sugar. After a month you can strain the mix, put it in a refrigerator and use. Or use just unstrained. Use only the good berries. No green or dried on the tree. This year I made a jam for fist time ever. Put just a couple of days ago. Wow – thank you ever so much for sharing the recipe! I have been paying enormous prices for this stuff to give to my family. This will save so much money and they can take it every day. You are a gem! 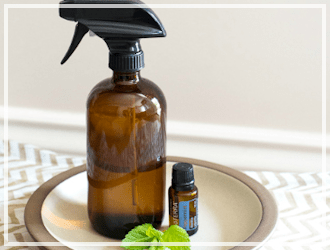 Have you ever used essential oils for flavouring instead? I only ask because I have those on hand as opposed to the regular spices. Thank you! 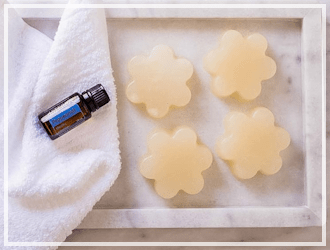 I love essential oils – I haven’t used them in this recipe, however one drop of cinnamon *might* be too much? I am not sure, but you can try and let me know what you think! 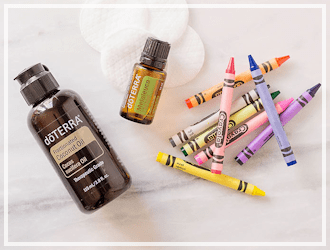 I wouldn’t add cinnamon essential oil… too strong an oil. 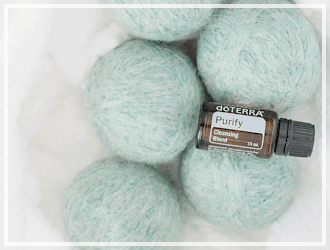 I use a very similar recipe and add powdered ginger and cinnamon, but do use 5 drops clove essential oil. I love the medicinal properties of clove oil and the flavor is just fine at 5 drops. First I’d like to say “I love your blog”!! Keep up the good work! Yes I am a firm believer in the elderberry supplement for preventative maintenance in flu season, thanks for the recipe, want to try it.